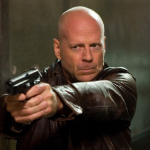 Friday I enjoyed a fun day looping the latest Bruce Willis film, Extraction. The hardest part was the day before, learning everything I could about FBI lingo. We had to fill in various FBI office and situation room scenes with the background dialogue. This area was my assignment, to come up with authentic verbiage and create dialogue for the group. By the time I tried to go to sleep my brain was overwhelmed with codes, file numbers, abbreviations, acronyms, and “FBI-speak”. Now, I love comedy, this was suspense-drama, so I have to admit that it was tough writing basic office, human dialogue, and not make it funny. It was kind of like taking an old nursery rhyme, like 3 Blind Mice and hitting it with a thesaurus so it looks like, 3 sightless rodents. In this case, I wrote totally mundane office or situation room conversations, but felt like all 3 sightless rodents. The kicker is no one will really hear it anyway! But… if something does break through the main dialogue, at least I know I did my homework and it’s as close to authentic as possible. No Comments on "ADR a Bruce Willis Film"